Thank you for choosing Penwell-Gabel for your funeral and cremation needs. biographical information that will be used to complete paperwork with the state. What brought you to our website today? Please select a reason above. can provide you with more information, catalogs and pricing. These keepsakes contain a small portion of cremated remains. They are available in many styles, designs and metals. 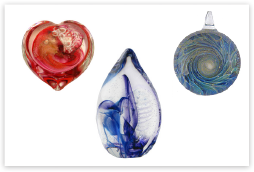 Created by glass artisans, these one-of-a-kind pendants, paperweights and decorative pieces incorporate a small portion of cremated remains into the design. 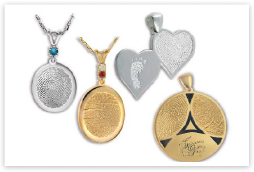 These are jewelry pieces that incorporate a three-dimensional fingerprint of your loved one. 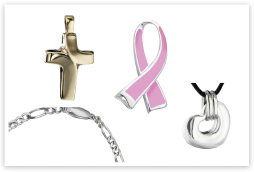 Available in 14k gold, sterling silver and stainless steel.